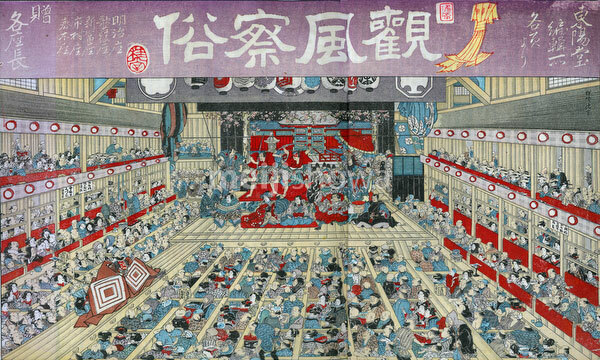 Interior of a kabuki theater with the audience eating, drinking and smoking, and characters from several plays on stage. Ichikawa Danjuro is approaching on the hanamichi in the role of Kagemasa. From Fuzokuga Ho 100 go (風俗画報/第100号祝宴会) printed in 1895 (Meiji 28). After a print by Toyokuni III dating from 1858 (Ansei 4).